Dr. Aaron Young is an Assistant Professor in the Woodruff School of Mechanical Engineering at Georgia Tech and a member of the Institute for Robotics & Intelligent Machines. He also is a program faculty member of the Biomedical Engineering School. He is director of the Intelligent Prosthetic & Exoskeleton Controls (EPIC) Lab focused on lower limb robotic augmentation. His research focuses on optimizing control systems in wearable robotic devices by studying their effect on human locomotion biomechanics in clinical populations. The long term goal is to create clinically viable control systems for wearable robotic lower limb assistive devices that are smart and intuitive to use. His previous experience includes a post-doctoral fellowship at the University of Michigan in the Human Neuromechanics Lab working with lower limb exoskeletons and powered orthoses to augment human performance. His dissertation work at Northwestern University in the Center for Bionic Medicine at the Rehabilitation Institute of Chicago focused on using machine learning strategies for enabling intent recognition systems for powered lower limb prostheses. Dr. Young is interested in researching wearable robotic technology to improve mobility in individuals with walking disability. This may include limb loss, stroke, cerebral palsy, advanced age/arthritis, spinal cord injury and other neurological diseases. For many of these individuals, community mobility is greatly impaired which has implications in long term health, economics (such as the ability to work a job), independence and quality of life. Additionally, we are interested in using exoskeleton technology to help augment human capability such as for industrial worker safety and efficacy during heavy tooling, construction, and/or lifting. To address these critical societal needs, Dr. Young works on understanding the science of how robotic technologies can physically work with human benefactors to improve clinical outcomes and mobility. Specifically, Dr. Young’s research focuses on the control system which couples the device to the user. By using new artificial intelligence and machine learning techniques, his group is pioneering strategies to greatly enhance the human experience with wearable robotic technology. These technologies have the potential to increase independence and community mobility, reduce caretaker burden, and ultimately improve the quality of life in individuals suffering from lower limb disability. 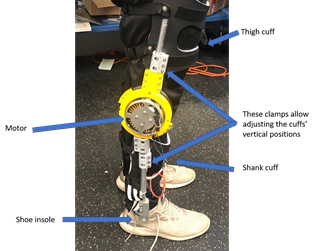 Robotic Hip Exoskeletons for Stroke Survivors and the Elderly: One project that is funded by an NSF NRI (National Robotics Initiative) grant focuses on using machine learning algorithms to improve robotic exoskeleton control. 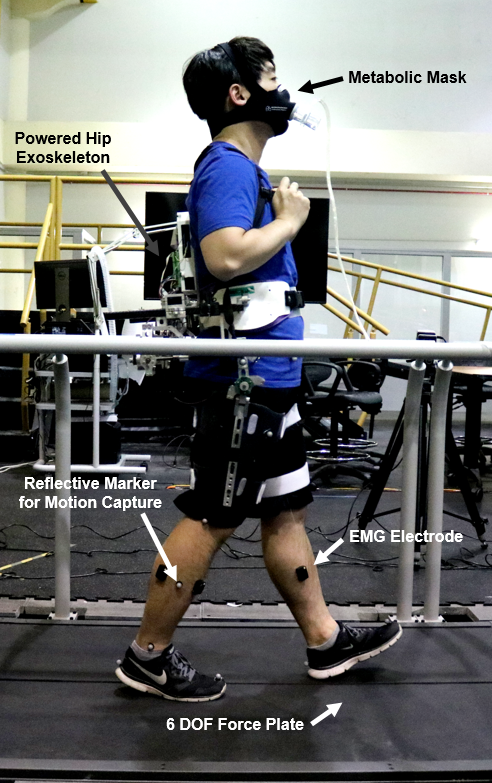 Dr. Young’s team is interested in using information from the nervous system, specifically myoelectric signaling (EMG), to sync a human user with their exoskeleton counterpart to improve the exoskeleton’s assistive capabilities. The Young lab’s focus is to improve community ambulation capability, especially in the mobility impaired. In particular, stroke survivors could see large benefits in mobility and independence by assistive and rehabilitative robotic technologies that are being created. 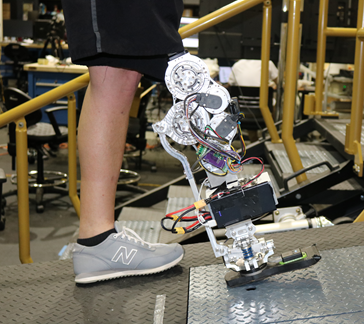 By combining robotic exoskeletons and artificial intelligence, the goal of this project is to improve gait biomechanics, reduce metabolic cost and improve community walking speed and mobility for those with walking disability. 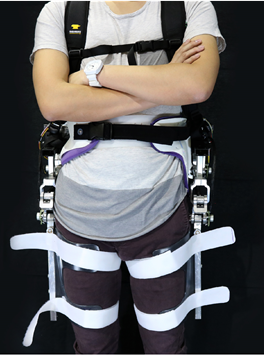 Examples of experiments using the EPIC lab’s hip exoskeleton devices. 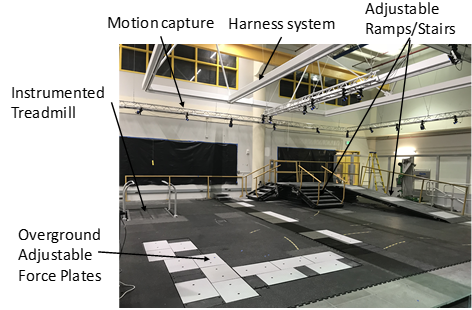 These include community ambulation of ramps and stairs, biomechanical testing, and using EMG information to inform advanced control systems using machine learning. Powered Prostheses for Individuals with Amputation: Another project that is currently funded by the DoD CDMRP (Congressionally Directed Medical Research Program) focuses on intent recognition systems for powered lower limb prostheses based on sensor fusion. 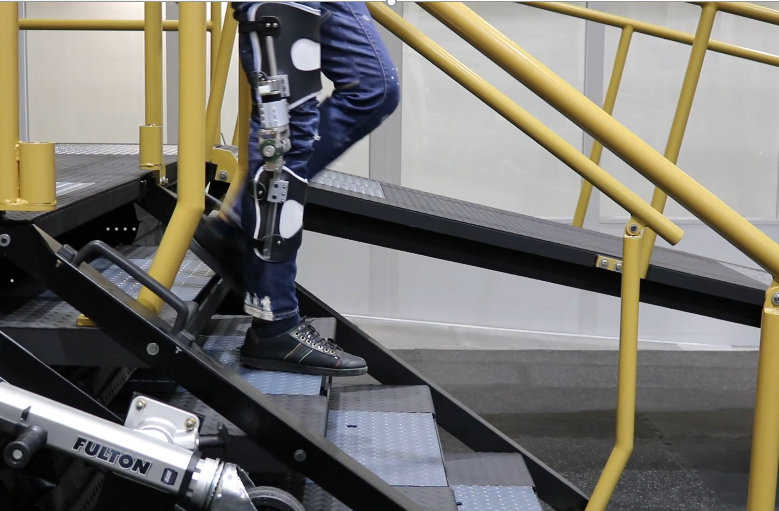 This research has advanced state-of-the-art control systems for lower limb amputees so that their robotic prostheses automatically adjust assistance based on their daily tasks, such as climbing stairs, traversing slopes, or walking at different speeds. 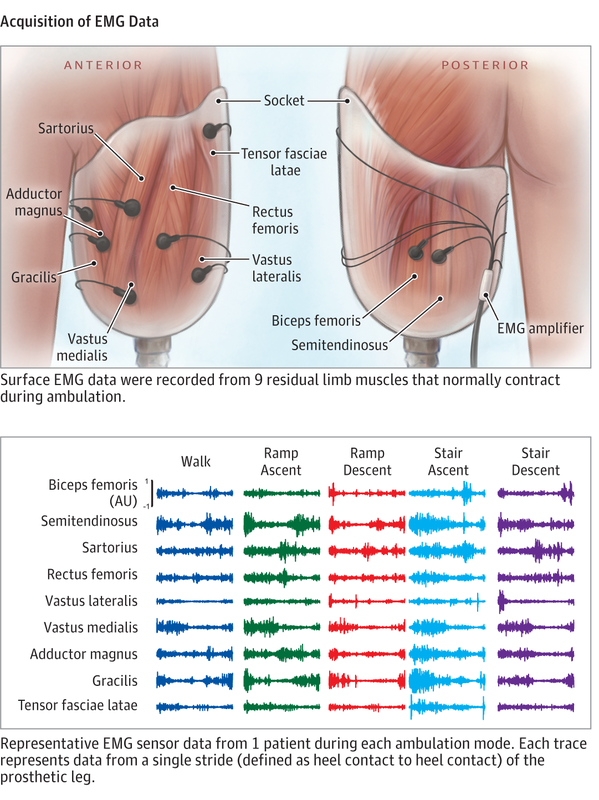 For individuals with major lower limb amputation, community ambulation is often impaired due to reduced capabilities to ambulate over difficult terrain such as ramps and stairs. In addition, these individuals also suffer from chronic leg and back pain and experience a reduced self-selected walking speed. Powered knee/ankle prosthesis examples. Key innovations of our research include designing intelligent intent recognition systems, optimizing control based on amputee biomechanics, and clinical testing of our robotic solutions a wide range of individuals with transfemoral amputation in comparison to non-robotic (passive) prostheses. The EPIC lab’s long-term goal is to use robotic assistive technology with transfemoral amputees to help address this health problem. Our primary objective is to inform, implement and clinically test robotic knee & ankle prosthesis control strategies capable of enhancing daily ambulation of people with transfemoral amputation. This includes providing capability to ascend and descend stairs step-over-step, increase walking speed capability and provide increased proficiency to handle ramps and slopes. 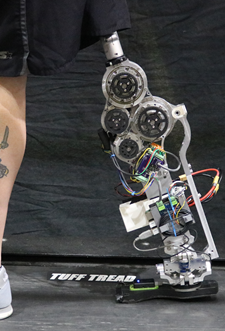 To accomplish these objectives, we are designing state-of-the-art robotic control systems and testing these on powered prostheses on individuals with above knee amputation. Our group studies amputee biomechanics during ambulation with robotic technology and optimized the controllers to improve long term health outcomes in this population by offloading the overburdened intact joints, which could reduce the amount of osteoarthritis and osteoporosis that frequently occurs in this population. Robotic Knee Orthosis Technology for Pediatrics: A third project pursued by the EPIC lab is funded by a APDC (Atlanta Pediatric Device Consortium) seed grant award through the FDA and focuses on applying robotic exoskeleton technology to aid children with significant mobility impairment such as that caused by cerebral palsy. Technology options are extremely limited for children, and no exoskeleton devices are available on the market specifically for pediatrics. Yet, numerous children with cerebral palsy could benefit from assistive technology to aid in rehabilitation and gait training. 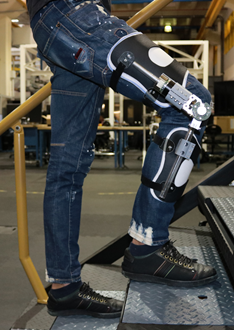 The EPIC lab has developed a low-profile, light weight knee exoskeleton with a unique control technology to aid children with mobility impairment to adopt a more efficient gait and encourage locomotion. We have an advanced biomechatronics group that builds robotic assistive devices with a range of active projects. A major aspect of this research that we focus on is the human-machine control system which couples the device to the user. 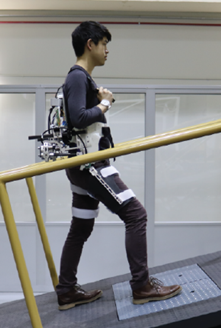 These control systems include a range of algorithms which include recognizing the users’ intent (such as their desire to stand up or initiate a walking step) to how to optimally control the robotic actuators to provide device assistance. 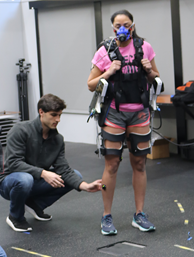 A fundamental part of this research involves human biomechanical testing to optimize control performance with typical objectives including reducing metabolic cost (energy consumption) and restoring normal human biomechanics. 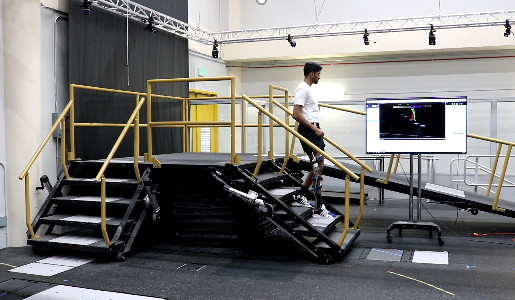 We have an advanced biomechanics lab to measure humans interacting with assistive devices which includes a force instrumented terrain park with stairs, ramps and overground walking spaces and multiple treadmills with surrounding motion capture. Biomechanics are analyzed using a combination of force plates and motion capture to determine kinematics, and internal joint torques and forces. An important objective of our lab is to develop devices that assist individuals in community ambulation activities that include slopes, ramps, stairs, curb stepping, turning, and walking over uneven terrain. 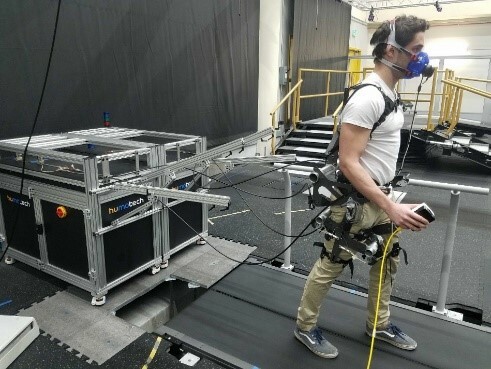 These activities are necessary for traversing urban environments and our lab has the ability to simulate different tasks and terrains to measure human biomechanics in a large range of circumstances. We are hoping to explore new partnerships in this area of assistive device technology with the intent of translating powered prosthesis and exoskeleton technology into commercial and clinical use in the near future. EPIC lab facility. We have a state-of-the-art testing facility for wearable robotic devices. This includes a unique terrain park for measuring inverse dynamics of humans using exoskeletons and prosthesis with force plate instrumentation for multiple stair sets, an adjustable incline ramp, and overground locomotion in both straight and turning configurations. Full surround motion capture supports kinematic reconstructions of movement. 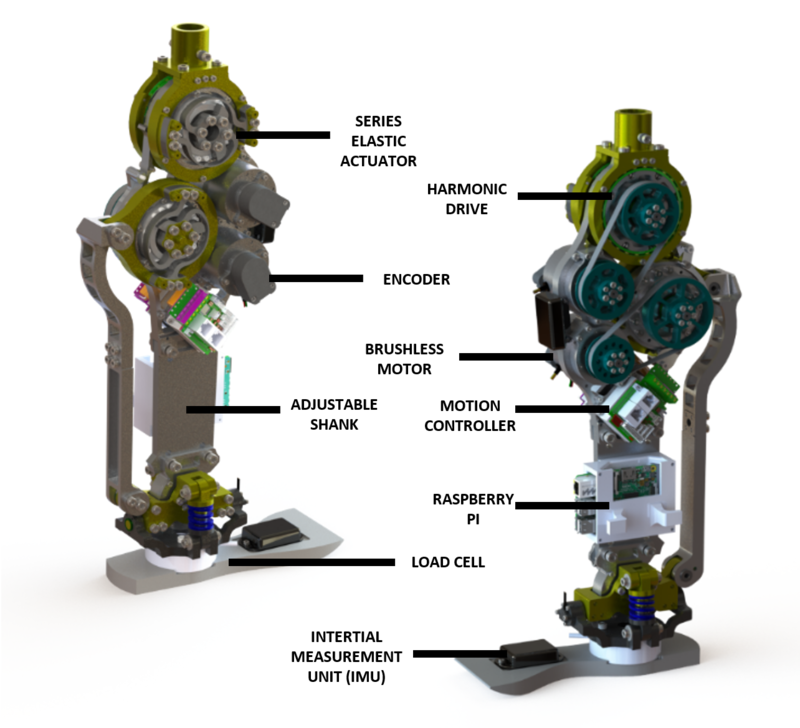 The HumoTech system (right) allows for emulation of prostheses and exoskeletons for controller testing. Students who work with Dr. Young will work with an interdisciplinary group in robotics, mechanical, electrical and biomedical engineering. They will learn how to conduct human subject experiments and work with clinicians in physical therapy and P&O (Prosthetics and Orthotics Program) to do clinically translatable research. Additionally, they will develop expertise in robotics, human augmentation, mechatronic systems, machine learning, biological signal processing, and control. Human augmentation group at Georgia Tech (PIs: Aaron Young & Greg Sawicki). We have a unique team and facility to design and test wearable robotics for enhancing human health. Ana Groff, Stella Thai, Inseung Kang, Jeff Hsu, Aaron Young, “Control Strategies of a Powered Assist Hip Exoskeleton in Subjects with Stroke,” 45th Meeting of the American Academy of Orthotists & Prosthetists, Orlando, FL, 2019. Krishan Bhakta, Jonathan Camargo Leyva, Maximillian Spencer, Brian White, Noah Cho, Kinsey Herrin, Lee Childers, Aaron Young, “Effect of Experimental Powered Prosthesis on Hip Kinetics: A single Case Pilot Study,” 45th Meeting of the American Academy of Orthotists & Prosthetists, Orlando, FL, 2019. Claire Kilpatrick, Summer Lee, Inseung Kang, Hsiang Hsu, Lee Childers, Aaron Young, “The Impact of Hip Exoskeleton User Interface on User Comfort and Metabolic Cost: A Pilot Study,” 45th Meeting of the American Academy of Orthotists & Prosthetists, Orlando, FL, 2019. Pratik Kunapuli, Krishan Bhakta, Aaron Young, “'Neural Network Based Estimation of Gait Phase in a Powered Hip Exoskeleton,” Biomedical Engineering Society Conference, Atlanta, GA, 2018. 29. Will Flanagan, Jonathan Camargo Leyva, Aaron Young, “The Value of EMG for Estimating Continuous Locomotion Parameters During Human Ambulation,” Biomedical Engineering Society Conference,Atlanta, GA, 2018. 28. Eun Chan Kwak, Dawit Lee, Inseung Kang, Aaron Young, “The Effect of Powered Assistance on Uphill Human Walking Using a Robotic Knee Exoskeleton,” Biomedical Engineering Society Conference, Atlanta, GA, 2018. 27. Hsiang Hsu, Inseung Kang, Aaron Young, “Design and Evaluation of a Proportional Myoelectric Controller for Hip Exoskeleton during Normal Walking,” ASME Dynamic Systems and Controls Conference, Atlanta, GA, 2018. 26. Jonathan Camargo-Leyva, Krishan Bhakta, Aaron Young, “Stochastic Optimization of Impedance Parameters for a Powered Prosthesis Using a 3D Simulation Environment,” ASME Dynamic Systems and Controls Conference, Atlanta, GA, 2018. 25. Inseung Kang, Hsiang Hsu, Aaron Young, “Design and Validation of a Torque Controllable Hip Exoskeleton for Walking Assistance,” ASME Dynamic Systems and Controls Conference, Atlanta, GA, 2018. 24. Krishan Bhakta, Jonathan Camargo-Leyva, Aaron Young, “Control and Experimental Validation of a Powered Knee and Ankle Prosthetic Device,” ASME Dynamic Systems and Controls Conference, Atlanta, GA, 2018. 23. Jonathan Camargo-Leyva, Aaron Young, “Muscle synergies in simultaneous movement of upper limb,” International Conference of the IEEE Engineering in Medicine and Biology, Honolulu, HI, 2018. Jonathan Camargo-Leyva, Noel Csomay-Shanklin, Bharat Kanwar, Aaron Young, “Continuous Walking Speed Estimation using Neural Networks and Multi-Sensor Data Fusion,” International Conference of the IEEE Engineering in Medicine and Biology, Honolulu, HI, 2018. Aaron Young, Krishan Bhakta, Jonathan Camargo-Leyva, Lee Childers, “Powered knee/ankle prostheses for improving walking capabilities in individuals with transfemoral amputation,” Military Health System Research Symposium, Kissimmee, FL, 2018. 20. Krishan Bhakta, Jonathan Camargo-Leyva, Aaron Young, “Sensor Fusion for Continuous Walking Speed Estimation on Powered Prostheses,” Dynamic Walking, Pensacola, FL, 2018. 19. Inseung Kang, Hsiang Hsu, Aaron Young, “Effect of Hip Torque Assistance Levels on Human Metabolic Cost,” Dynamic Walking, Pensacola, FL, 2018. 17. Jonathan Camargo Leyva, Aaron Young, “Combined Strategy of Machine Vision with a Robotic Assistant for Nail Biting Prevention.” 14th International Conference on Computer and Robot Vision, Edmonton, CA, 2017. Aaron Young, Jessica Foss, Hannah Gannon, Daniel Ferris, “Changes in Human Metabolics Based on Assistance Timing with a Powered Hip Exoskeleton.” 40th Annual Meeting of the American Society for Biomechanics, Raleigh, NC, 2016. Annie Simon, Kimberly Ingraham, John Spanias, Aaron Young, Levi Hargrove, “Development and Preliminary Testing of a Flexible Control System for Powered Knee-Ankle Prostheses.” 6th IEEE RAS/EMBS International Conference on Biomedical Robotics and Biomechatronics, Singapore, 2016. Aaron Young, Bridget Cook, Daniel Ferris, "Proportional Myoelectric Control of a Robotic Hip Exoskeleton." 39th Annual Meeting of the American Society for Biomechanics, Columbus, OH, 2015. Nicholas Fey, Aaron Young, Ann Simon, Suzanne Finucane, Kimberly Ingraham, Elizabeth Halsne, Todd Kuiken, Levi Hargrove, “Towards Clinically Viable Neural Control of Powered Lower-Limb Prostheses.” Military Health System Research Symposium. Fort Lauderdale, FL, 2014. Suzanne Finucane, Annie Simon, Kim Ingraham, Nicholas Fey, Robert Lipschutz, Aaron Young, Elizabeth Halsne, Levi Hargrove, “Training for Transfemoral Amputees Ambulating on a Powered Lower Limb Prosthesis.” 40th Meeting of the American Academy of Orthotists & Prosthetists. Chicago, IL, 2014. Aaron Young, Ann Simon, Nicholas Fey, Levi Hargrove. “Classifying the Intent of Novel Users During Human Locomotion Using Powered Lower Limb Prostheses.” 6th International IEEE EMBS Conference on Neural Engineering. San Diego, CA, 2013. Ann Simon, Nicholas Fey, Kimberly Ingraham, Aaron Young, Levi Hargrove. “Powered Prosthesis Control During Walking, Sitting, Standing and Non-Weight Bearing Activities Using Neural and Mechanical Inputs.” 6th International IEEE EMS Conference on Neural Engineering. San Diego, CA, 2013. Dennis Tkach, Aaron Young, Lauren Smith, Levi Hargrove, “Performance of pattern recognition myoelectric control using a generic electrode grid with Targeted Muscle Reinnervation patients,” International Conference of the IEEE Engineering in Medicine and Biology, San Diego, CA, 2012. Aaron Young, Lauren Smith, Elliott Rouse, Levi Hargrove “A New Hierarchical Approach for Simultaneous Control of Multi-Joint Powered Prostheses.” IEEE RAS-EMBS International Conference on Biomedical Robotics and Biomechatronics, Rome, Italy, 2012. Aaron Young, Levi Hargrove, “Effects of Interelectrode Distance on the Robustness of Myoelectric Pattern Recognition Systems,” International Conference of the IEEE Engineering in Medicine and Biology, Boston, MA, 2011. Nicholas Fey, Ann Simon, Aaron Young, Levi Hargrove, “Knee Swing-initiation and ankle plantar flexion control using an activate prosthesis across walking speeds and users.” 37th Annual Meeting of the American Society of Biomechanics, Omaha, NE, 2013. Aaron Young, Levi Hargrove, “Assessment of Electrode Configuration on the Robustness of Myoelectric Pattern Recognition to Electrode Shift,” Myoelectric Controls Symposium, Fredericton, CA, 2011. Elliott Rouse, Aaron Young, Camila Shirota, Connor Griffith, Levi Hargrove, “Data Fusion for Lower Limb Prosthesis Locomotion Mode Detection.” Biomedical Engineering Society Conference, Austin, TX, 2010. Aaron Young, Levi Hargrove, “The Effects of Electrode Misalignment on Myoelectric Pattern Recognition,” Biomedical Engineering Society Conference, Austin, TX, 2010. Aaron Young, Levi Hargrove, “Strategies to Reduce Myoelectric Pattern Recognition Sensitivity to Electrode Shift,” International Society of Electrophysiology and Kinesiology Conference Proceedings, Aalborg, Denmark, 2010. Levi Hargrove and Aaron Young, “Systems and Methods for Hierarchical Pattern Recognition for Simultaneous Control of Multiple Degree of Freedom Movements for Prosthetics.” U.S. Patent No. 9,907,489, March 6, 2018. Aaron Young and Levi Hargrove, “Ambulation Prediction Controller for Lower Limb Assistive Device.” U.S. Patent Number 9,443,203 B2, September 13, 2016.